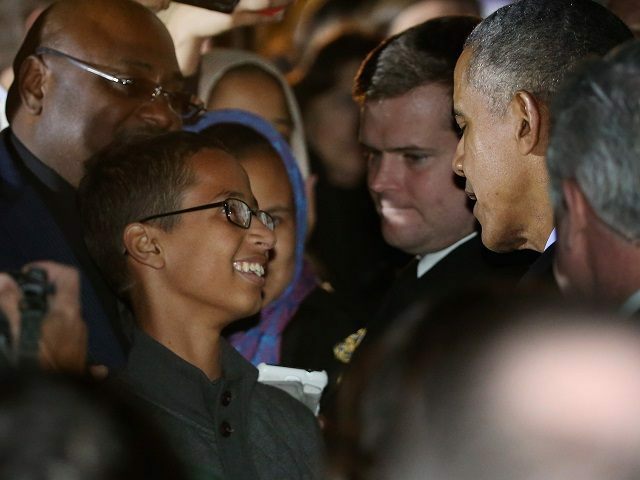 The boy, and his Sudan-born, Islamic politician-father, took back the suspect device Oct. 23, four days after President Barack Obama choose to hug him at the White House, in public, for the world to see. The clock-in-box is non-functional because the screen can’t be seen when the box is closed. The suspect device is also hazardous, because the 120-volt power system is exposed. When the boy was briefly detained, progressives — including Obama and a group of Muslim cops in New York — profiled the Muslim boy as innocent, and profiled the local teachers and police as racists and inordinately worried about the violence urged in the Islamic holy book. The boy and his family took that anti-American prejudice around the world, greatly aided by a supportive Sept. 16 tweet from Obama. The day after Obama’s message, the boy declared he was detained “because I’m Muslim,” during an interview on the al Jazeera network. During his anti-American migration, or hijra, the boy’s father used privacy laws to gag local officials who wanted to defend their cops and teachers from the progressives’ bile. The boy’s family — including Ahmed, his brother and his two sisters, plus his grandmother — will now enjoy all the benefit of living in Qatar’s vibrant Islamic culture, and attend the local schools. Recent international tests show Qatar’s average educational score is at two-thirds the level earned by South Korean students, and four-fifths the score earned by the average American student.